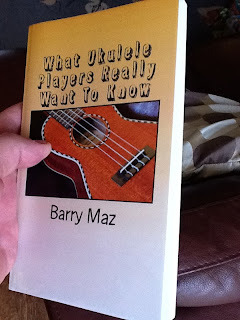 I haven't run a competition on Got A Ukulele for a little while, so it's about time I changed all that. In this competition you have the chance to win a copy of my ukulele handbook, "What Ukulele Players Really Want To Know" in paperback! I will also throw in a Got A Ukulele Button badge! ,marking your subject line BOOK COMPETITION. QUESTION - WHAT YEAR WAS THE UKULELE VIRTUOSO JAKE SHIMABUKURO BORN? All the correct answers will be thrown in a hat shaped receptacle and a winner drawn at random. What could be simpler? Answers need to be with my 31 October to count in the draw! 4. On draw day, I will put all eligible entries in a hat and draw a winner. My decision on the winner is final and no correspondence will be entered into. 7. In the event the winner does not respond to the request for address within 14 days, I will pick another name from the hat. where does one email the entry? To the email address in the post above! Entered...even though I downloaded the ebook it'd be nice to have the real thing too. Thanks Rik! Yeah, ebooks are really handy and mine has been popular, but it's nice to have a paper copy! Is this open to New Zealanders?